Oral leukoplakia (OL) is considered as a most common potentially malignant disorder (PMD) affecting the mucosa of the oral cavity. With the passage of time, the definitions of OL kept evolving. Leukoplakia usually presents after the fourth decade of life and is one of the most common oral PMDs affecting the oral cavity. Based on the macroscopic features of OL, it can be classified into two subtypes: homogeneous and nonhomogeneous. One of the most common oral potentially malignant disorders (PMDs) affecting the oral cavity is oral leukoplakia (OL). In the first international conference on OL (1984) in Malmo, Sweden, OL was defined as “a white patch or plaque that cannot be characterized clinically or pathologically as any other disease and is not associated with any physical or chemical causative agent except use of tobacco.” In the year 1997, the WHO defined leukoplakia as “a predominantly white lesion of the oral mucosa that cannot be characterized as any other definable lesion. van der Waal in 2007 suggested a new definition that includes histological confirmation, but this has not been yet assessed by the WHO, “A predominantly white lesion or plaque of questionable behaviour having excluded, clinically and histopathologically, any other definable white disease or disorder.” Consumption of alcohol along with other tobacco products has a synergistic effect and is thought to be a causative factor in OL. On an average, the rate of malignant transformation of OL has been estimated to be 1.36%. This case report emphasizes on the treatment aspects of OL and to further prevent its malignant progression. 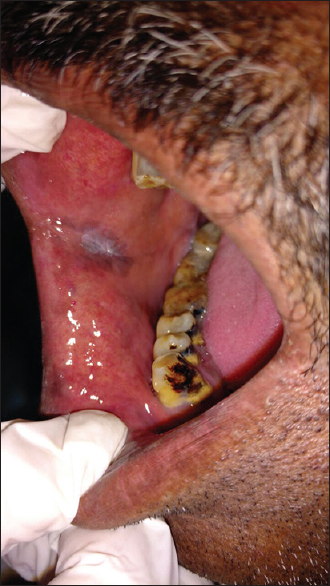 A 49-year-old male patient reported to the department of oral medicine and radiology with a chief complaint of a whitish area in his right inner side of the cheek for the past 6 months. On eliciting personal history, the patient has a habit of smoking cigarettes since the last 7 years, 5 cigarettes per day. On clinical examination, no abnormalities were detected extraorally. Inspection of the lesion intraorally revealed an irregular whitish plaque on the right buccal mucosa at the line of occlusion, measuring approximately 1 cm × 2 cm at its greatest diameter [Figure 1]. The lesion extends anteriorly 1 cm away from the commissure of the lip up to 4 cm short of retromolar trigome region posteriorly, superiorly 3 cm below the upper buccal vestibule, and inferiorly 4 cm short of lower buccal vestibule. The boundaries of the lesion appeared to be well defined. Similarly, an irregular whitish plaque was noted on the left buccal mucosa at the line occlusion, measuring approximately 1.5 cm × 1.5 cm at its greatest diameter [Figure 2]. The lesion extends anteriorly 1 cm away from the commissure of the lip and extending 4.5 cm short of retromolar trigome region posteriorly. Superiorly, the lesion was present 2.5 cm below the upper buccal vestibule and inferiorly 4 cm short of lower buccal vestibule. The lesion had well-defined boundaries. The surface over the lesion appeared to be rough and wrinkled, giving it a cracked mud appearance. The surrounding mucosa appeared to be brownish-black suggestive of postinflammatory melanin pigmentation. On palpation of both the lesions, all inspectory findings were confirmed with respect to size, shape, and extent. The lesions were nonscrappable and nontender. It was raised 0.5 mm over the surface. No bleeding from the site was noticed. Based on the history and clinical examination, a provisional diagnosis of bilateral homogeneous leukoplakia was considered. The differential diagnosis of frictional keratosis and plaque type of lichen planus was given. The patient was advised a routine hematological investigation which reported to be normal followed by toluidine blue staining which revealed retentive areas within the lesion [Figure 3]. Patient motivation and counseling with respect to tobacco cessation was done. Excisional biopsy of both the lesions was performed and the specimen was submitted for histopathological examination which revealed OL. A final diagnosis of OL was confirmed based on the history, clinical examination, and histopathological report. The patient was recalled after 1 week for suture removal and follow-up. Healing of the biopsy site was adequate [Figure 4]. Based on the macroscopic features of OL, it can be classified into two subtypes: homogeneous and non-homogeneous., In our case, the lesion clinically manifested like a whitish plaque with a wrinkled surface texture, typically characterizing, homogeneous leukoplakia. Leukoplakia is a clinical terminology and does not have any particular or specific histological appearance. Histopathologically, leukoplakia shows signs of hyperkeratosis, acanthosis, atrophy, and may exhibit various degrees of epithelial dysplasia. Histological changes can be appreciated when there are signs of dysplasia. It may be followed by loss of architectural integrity of epithelial cells. These findings distinguish OL into dysplastic and nondysplastic lesions. Higher risk of malignant transformation to oral cancer has been associated with the presence of dysplasia in histological examination. The strongest predictor for malignant transformation is the dysplastic changes as are seen within the epithelium. Studies have been reported that all OL lesions should be treated irrespective of the presence of any dysplastic changes. Multiple treatment modalities have been documented including both nonsurgical approaches. Nonsurgical modalities help to prevent malignant transformation. They serve as conservative management, in particular within patients that entail a larger area concerning the oral mucosa, or in those medically compromised patients pertaining to high surgical risks. Consumption of carotenoids (β-carotene, lycopene); Vitamins A, C, and K; and fenretinide, bleomycin, and photodynamic therapy have shown significant regression of the lesion, but randomized controlled trials for nonsurgical treatment have not shown much of evidence in the prevention of malignant transformation and recurrence. Surgical approaches encompass conventional surgery, electrocauterization, laser ablation, or cryosurgery. Conventional surgical procedures entail excision of the lesion. It can be accompanied with or without the placement of skin graft or any other dressing material. It is often not practicable for widespread lesions or those in complex anatomical locations. The associated morbidity of surgery also makes it less appealing for extensive lesions. The related dismalness of surgery additionally makes it less engaging for broad lesions. Complete red lesions (erythroplakia) are at higher risk for malignant transformation. However, the clinician cannot completely rely upon the macroscopic features for diagnosis. Histological analysis is obligatory to assess the biological potential of the lesion. The site and age are predictive indicators for malignant transformation. Patients >60 years of age with the site of the lesion on the lateral border of the tongue or on the ventral surface and those who presents with nonhomogeneous type macroscopically with high grade of dysplastic changes correlate with an increased risk of malignant transformation. Epithelial dysplasia has been viewed as a standout among the most vital indicators of malignant potential. 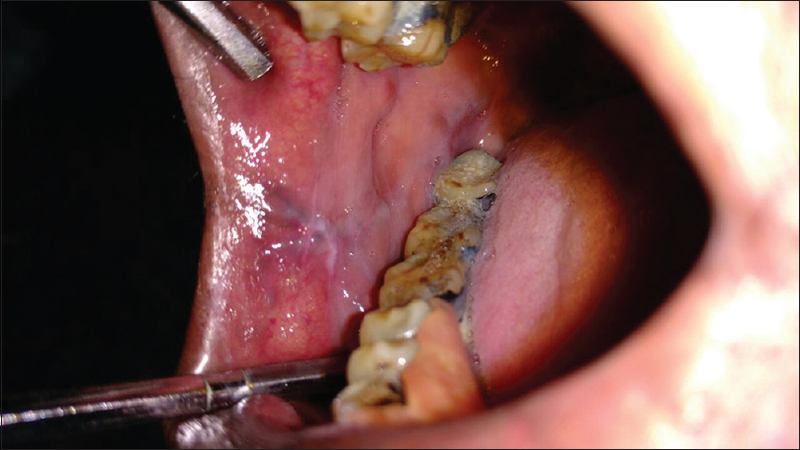 It has been revealed that dysplastic OL conveys a 5-fold more serious risk of malignant transformation than that of nondysplastic OL, and its prescient value relies upon the predominance of leukoplakia in a given populace. Throughout the years, it has been recommended that DNA content (DNA ploidy) is an imperative indicator for malignant transformation of leukoplakia or erythroplakia. When a multivariate analysis was performed in a case–control study, it showed that anomalous DNA content was a significant indicator for progression to malignancy with a hazard ratio (HR) of 3.3 (95% confidence interval: 1.5–7.4) redressed for site and grade of dysplasia. Bremmer et al. conducted a study which showed that DNA aneuploidy was concomitant with the progression of cancer (HR: 3.7, 54% sensitivity and 60% specificity). It was concluded from their study that DNA aneuploidy has a higher risk for malignant transformation as compared to DNA diploid lesions. Few biomarkers have been reported which said to be significant predictors for malignant transformation such as Ki-67 (Mib-1) and bromodeoxyuridine, combined biomarker score of chromosomal polysomy, p53, and loss of heterozygosity. The events that take place at a molecular level to induce transformation of a premalignant lesion to carcinoma are have not been known yet. Overexpression (or underexpression) of any biomarkers is considered to have a significant predictive value over standard histological examination. Oral cytological examination has been proven efficient for the examination of dysplastic lesion, but its high variability in the results as false positive and false negative has been its limitation. Though the prevalence rate of OL is estimated to be 1.4%–22% and is found to be six times higher in smokers as compared to nonsmokers, its early recognition and management is necessary as it carries a potential for malignant transformation. Kayalvizhi EB, Lakshman VL, Sitra G, Yoga S, Kanmani R, Megalai N. Oral leukoplakia: A review and its update. J Med Radiol Pathol Surg 2016;2:18-22. Deliverska EG, Petkova M. Management of oral leukoplakia – Analysis of the literature. IMAB 2017;23:1495-504. Nair SN, Holla V, Kini R, Rao PK. 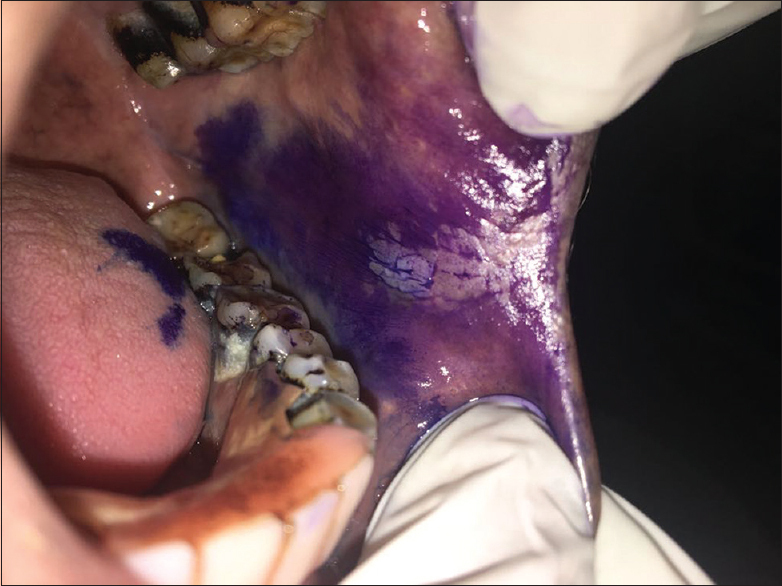 Bilateral speckled leukoplakia: A case report. Austin J Dent 2017;4:1-2. Kumar A, Cascarini L, McCaul JA, Kerawala CJ, Coombes D, Godden D, et al. How should we manage oral leukoplakia? Br J Oral Maxillofac Surg 2013;51:377-83. Warnakulasuriya S, Ariyawardana A. Malignant transformation of oral leukoplakia: A systematic review of observational studies. J Oral Pathol Med 2016;45:155-66. Bradley G, Odell EW, Raphael S, Ho J, Le LW, Benchimol S, et al. Abnormal DNA content in oral epithelial dysplasia is associated with increased risk of progression to carcinoma. Br J Cancer 2010;103:1432-42. Bremmer JF, Brakenhoff RH, Broeckaert MA, Beliën JA, Leemans CR, Bloemena E, et al. Prognostic value of DNA ploidy status in patients with oral leukoplakia. Oral Oncol 2011;47:956-60. Axéll T, Pindborg JJ, Smith CJ, Van der Waal I. An International Collaborative Group on Oral White Lesions. 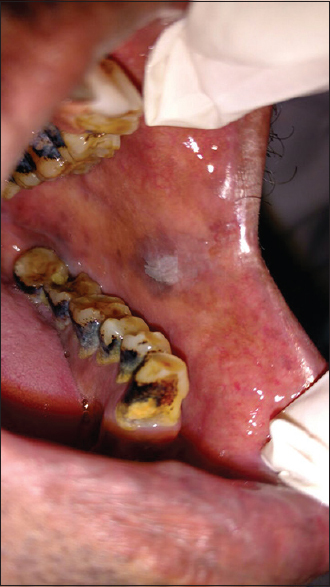 Oral white lesions with special reference to precancerous and tobacco-related lesions: conclusions of an international symposium held in Uppsala, Sweden, May 18–21 1994. Journal of oral Pathology & Medicine 1996;25:49-54. Fleskens S, Slootweg P. Grading systems in head and neck dysplasia: Their prognostic value, weaknesses and utility. Head Neck Oncol 2009;1:11. Speight PM, Epstein J, Kujan O, Lingen MW, Nagao T, Ranganathan K, et al. Screening for oral cancer-a perspective from the global oral cancer forum. Oral Surg Oral Med Oral Pathol Oral Radiol 2017;123:680-7.